For other people named Gilbert White, see Gilbert White (disambiguation). This 'portrait' is now generally regarded as inauthentic. Gilbert White FRS (18 July 1720 – 26 June 1793) was a "parson-naturalist", a pioneering English naturalist and ornithologist. He remained unmarried and a curate all his life. He is best known for his Natural History and Antiquities of Selborne. White was born in his grandfather's vicarage at Selborne in Hampshire. He was educated at the Holy Ghost School  and by a private tutor in Basingstoke before going to Oriel College, Oxford. He obtained his deacon's orders in 1746, being fully ordained in 1749, and subsequently held several curacies in Hampshire and Wiltshire, including Selborne's neighbouring parishes of Newton Valence and Farringdon, as well as Selborne itself on four separate occasions. In 1752/53 White held the office of Junior Proctor at Oxford and was Dean of Oriel. In 1757 he became non-resident perpetual curate of Moreton Pinkney in Northamptonshire. After the death of his father in 1758, White moved back into the family home at The Wakes in Selborne, which he eventually inherited in 1763. In 1784 he became curate of Selborne for the fourth time, remaining so until his death. Having studied at the more prestigious Oriel, at the behest of his uncle, he was ineligible to be considered for the permanent living of Selborne, which was in the gift of Magdalen College. White and William Markwick collected records of the dates of emergence of more than 400 plant and animal species, White recording in Hampshire and Markwick in Sussex between 1768 and 1793. These data, summarised in The Natural History and Antiquities of Selborne as the earliest and latest dates for each event over the 25-year period, are among the earliest examples of modern phenology. His 1783–84 diary corroborates the dramatic climatic impacts of the volcanic 'Laki haze' that spread from Iceland with lethal consequences across Europe. Gilbert White's sister Anne was married to Thomas Barker (1722–1809), called 'The father of meteorology', and Gilbert maintained a correspondence with his nephew Samuel Barker, who also kept a naturalist's journal. 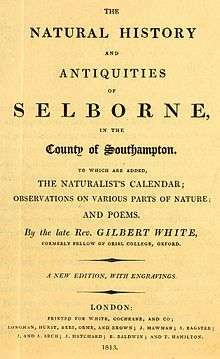 White is best known for his The Natural History and Antiquities of Selborne (1789). This is presented as a compilation of his letters to Thomas Pennant, the leading British zoologist of the day, and the Hon. Daines Barrington, an English barrister and another Fellow of the Royal Society, though a number of the 'letters' such as the first nine were never posted, and were written especially for the book. The book has been continuously in print since its first publication. It was long held, "probably apocryphally", to be the fourth-most published book in the English language after the Bible, the works of Shakespeare, and John Bunyan’s The Pilgrim’s Progress. The White family house in Selborne, The Wakes, now contains the Gilbert White Museum. The Selborne Society was founded in 1895 to perpetuate the memory of Gilbert White. It purchased land by the Grand Union Canal at Perivale in West London to create the first Bird Sanctuary in Britain, known as Perivale Wood. In the 1970s, Perivale Wood became a Local Nature Reserve. This initiative was led by a group of young naturalists, notably Edward Dawson and Peter Edwards, Kevin Roberts and Andrew Duff. It was designated by Ealing Borough Council under the National Parks and Access to the Countryside Act 1949. Flora Thompson, the countryside novelist said of White 'It is easy to imagine him, this very first of English nature writers, the most sober and modest, yet happiest of men. White is quoted by Merlyn in The Once and Future King by T.H. White and in The Boy in Grey by Henry Kingsley, in which White's thrush appears as a character. A documentary about White, presented by historian Michael Wood, was broadcast by BBC Four in 2006. White is commemorated in the inscription on one of eight bells installed in 2009 at Holybourne, Hampshire. White's frequent accounts of a tortoise inherited from his aunt in The Natural History and Antiquities of Selborne form the basis for Verlyn Klinkenborg's book, Timothy; or, Notes of an Abject Reptile (2006), and for Sylvia Townsend Warner's The Portrait of a Tortoise (1946). White, Gilbert (1795). A Naturalist's Calendar, with observations in various branches of natural history, extracted from the papers of the late Rev. Gilbert White of Selborne, Hampshire, Senior Fellow of Oriel College, Oxford. Never before published. London: printed for B. and J. White, Horace's Head, Fleet Street. Edited by J. Aikin. ↑ Baigent & Millard 1889, p. 161. ↑ Hazell, D. L., Heinsohn, R. G. and Lindenmayer, D. B. 2005. Ecology. pp. 97-112 in R. Q. Grafton, L. Robin and R. J. Wasson (eds. ), Understanding the Environment: Bridging the Disciplinary Divides. Sydney, NSW: University of New South Wales Press, (p. 99). ↑ H. A. Evans, Highways and Byways in Northampton & Rutland, Pocket edition (Macmillan & Co, London 1924), 161-62. ↑ "Gilbert White's House and Garden and the Oates Collection". Retrieved 2013-05-21. ↑ "Perivale Wood Local Nature Reserve owned and managed by the Selborne Society Ltd as the Gilbert White Memorial". The Selborne Society. Retrieved 2013-05-21. ↑ "Gilbert White, The Nature Man". Maya Vision International. 2006. Retrieved January 25, 2012. ↑ "Knowledge Base: Holybourne". Scovetta, Michael V. Retrieved 2013-05-21. Mabey, Richard (1986). 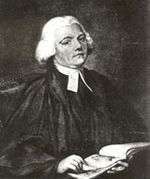 Gilbert White. A biography of the author of The Natural History of Selborne. Century Hutchinson. Newton, Alfred (1900). "White, Gilbert". In Lee, Sidney. Dictionary of National Biography. 61. London: Smith, Elder & Co.
Worster, D. 1994. Nature's Economy: A History of Ecological Ideas (2nd ed.). Cambridge; New York, NY, USA: Cambridge University Press. 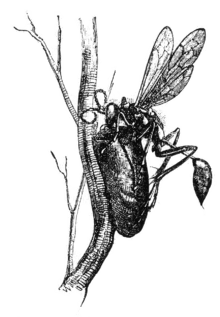 Wikisource has the text of a 1921 Collier's Encyclopedia article about Gilbert White.